Thanks to modern refrigeration, we can keep our food fresh longer. The problem is that the cool temperatures of the fridge don’t preserve all foods equally—as much as we’d like to believe it. People tend to throw almost everything into the fridge, assuming that it can only help. In reality, not every food item is the same chemically or physically and some will actually be harmed when refrigerated. In a few cases, foods will degrade faster in the fridge and the best case scenario is often loss of flavor. The “five second rule” is an unofficial pass to eat food dropped on the floor—provided only a few seconds have elapsed. The general wisdom is that it takes several seconds for bacteria to transfer to the food item, making it safe to eat if picked up quickly. In one survey, 87% of people admitted to eating dropped food at least once. The five second rule was never backed up by science but some researchers have decided to test the idea. Thankfully, my current home has good plumbing and I haven’t needed a plunger in a long time. But, I can’t say the same about previous places, especially some of those places in college! The best way to get a plunger to work well is to use the right plunger. There are two main types of plungers: toilet plungers and general purpose plungers (for almost everything other than toilets). Sinks and floor drains are typically flat, so a flat plunger is ideal. But toilet drains are typically curved and the curvature can vary widely among models. That means a flat sink plunger isn’t well suited for creating a seal and getting proper suction around the curvature of a toilet drain. You need good suction to clear a blockage and you’ll get better suction if you use a plunger with a flanged bottom to match the curve of the toilet drain. Showers should be refreshing, but it’s impossible to rejuvenate when a shower curtain is constantly rubbing your leg like an annoying dog. To combat this problem, some shower curtains have magnets or weights to help keep it in place. Others are made of heavy or clingy materials. Sometimes these are enough, but often they’re not. 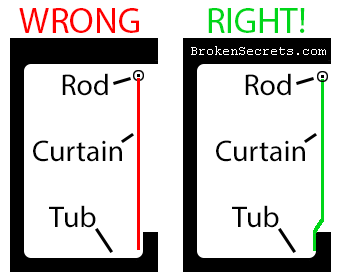 The best way to keep the shower curtain in place is to position the rod so the curtain can’t blow around. If the curtain is hanging straight down, it is likely to blow around as the shower heats up and cool air rushes under it. Due to gravity, the shower curtain wants to hang straight down. Use this to force the shower curtain against the side of the tub by placing the curtain rod over the edge of the tub or shower basin. The shower curtain will try to hang straight down but the tub is in the way so it will be forced against the tub and you can shower in peace. Sometimes you have to temporarily disconnect your home electronics. It can be difficult to find a device you can spare or remember which cables to put back later. Use bread expiration tags as labels. Dishwashers were an amazing invention. Long gone are the days of hand washing and drying dishes every night. Now we can simply load up the dishwasher, turn it on and wake up to a fresh load of sparkly, clean dishes. What many of my fellow dishwasher-loving friends may be pleased to learn is that your dishwasher has some major, hidden potential that extends way behind your basic dinner plate and water glass. Below is an extensive list of items that can also be washed in your dishwasher BUT, before scrolling down read this: your dishwasher can also be used for cooking. It’s true. And of all things, salmon seems to be the most popular choice for dishwasher cuisine. Sounds like a bad internet rumor but it has been proven accurate over and over again. Check out this recipe if you’re so inclined. Trying to prepare a Thanksgiving meal for your entire extended family? Save yourself some time by throwing all your baked potatoes in the dishwasher. They won’t cook and/or mash themselves but it will save you the time of having to scrub them all clean! Kitchen sponges, vegetable brushes etc.